Chou Chou! Adventures of a Briard Girl : Chou Chou's Eye Exam: Failing "Cotton Ball"
Chou Chou's Eye Exam: Failing "Cotton Ball"
I took Chou Chou to her annual eye exam. Every May, veterinary ophthalmologists across the country volunteer their time to provide free eye exams to service dogs and therapy dogs like Chou Chou. That's so generous! So Chou Chou waited for her doctor to come in and check her eyes. I expected a normal outcome, as in the past. But, she failed cotton ball. The doctor dilated Chou's eyes and did a thorough exam. Her retinas are normal. But I reported that I was concerned with her night vision; she seems fearful of car lights, garbage cans at the curb, and parked cars when we walk at night. The doctor seemed concerned. There are inherited eye conditions that begin with impaired night vision and can progress to total blindness; one is Progressive Retinal Atrophy (PRA). For some breeds, there are genetic tests for this: before breeding, dogs are tested to see if they carry this (recessive) trait. Two dogs with the PRA genetic marker would not be bred to each other. 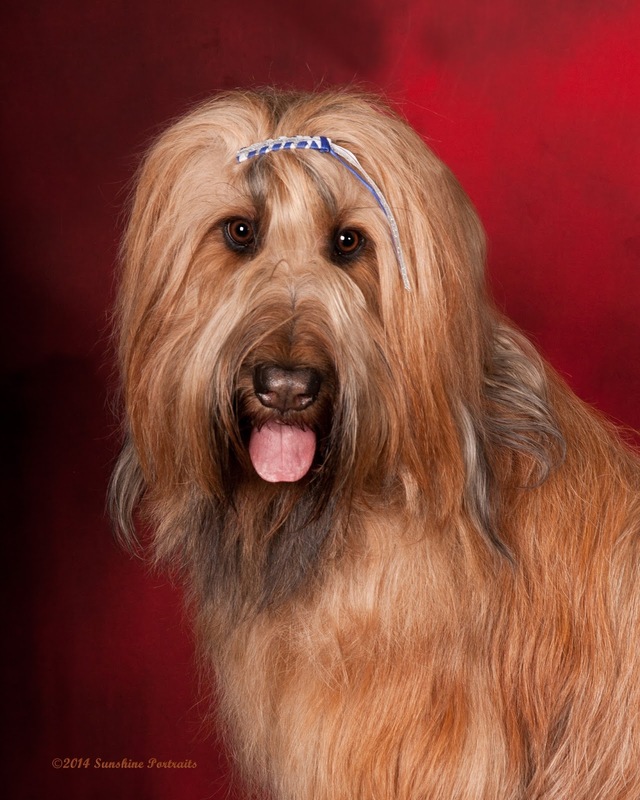 But a genetic test has not been developed (yet) for briards. The doctor did the cotton ball test. She tossed a cotton ball into the air and watched as Chou Chou's eyes followed it as it went up, and then down. That was easy. But the doctor repeated the throw several times, each time dimming the lights in the room a little more. In dim light, when tossed to the left, Chou Chou's eyes did not follow the cotton ball. She did not see it? She's never had any trouble with that before. This was worrisome. The ophthalmologist explained that sometimes retinal deterioration begins even before there is evidence of a problem during a regular eye exam. There is a more sensitive test to check the condition of her eyes, an electroretinograph (ERG). The ophthalmologist said we could do the test soon, or wait. No hurry... there is no cure, no treatment. The dogs just go blind. It took a couple of weeks for me to come to terms with this. Did I want to do the ERG? Did I want to know right now? I decided I did want to know. On July 8, I will bring Chou Chou to see an ophthalmologist at U.C. Davis Veterinary hospital for a second opinion. I've scheduled the ERG test with the ophthalmologist for July 10. And while doing some Internet research about eye diseases in dogs, I came across an eye supplement, Ocu-Glo Rx, that is supposed to stall deterioration. I asked the ophthalmologist and she said she has recommended it to her canine patients. So I started giving this to Chou Chou. Couldn't hurt (but expensive!). If the ERG is normal, I can stop giving the supplement (magic potion?). But there may be a problem, so why waste time? That's how I handle things -- proactively. Otherwise, I'd be depressed. The thought of my 3 year old pup going blind... I will have to live in denial to get through the next weeks, until I know for sure.